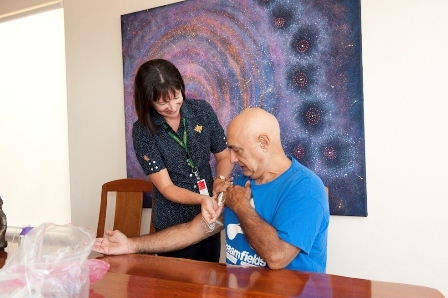 St John of God Health Choices provides Hospital in the Home (HITH) care to patients admitted directly from Murdoch Hospital’s Emergency Department. This type of care provides choice for patients, alleviates hospital demand and provides equal clinical outcomes to inpatient care. demand and provides equal clinical outcomes to inpatient care. The program, delivered in conjunction with Infectious Diseases Physicians at the hospital, was introduced in the Emergency Department in April 2014 to ensure patients receive care ‘in the best place’. Clinical Projects Coordinator Sarah Goy says the visits are of particular benefit to patients with cellulitis, urinary tract infections and chest infections. “It saves patients being admitted or visiting hospital every day to have for example, intravenous medications,” says Ms Goy.